The end of last week saw outcry by many, particularly those of Asian-American heritage at the casting of Matt Damon in the new movie The Great Wall. To quickly summarise, The Great Wall is about Matt Damon’s (White) character helping defend China from invading monsters. The complaints arose because many are citing that this is another example of Hollywood ignoring and looking past actors of any other ethnic and national background other than White. This isn’t a new argument; there are many recent cases of casting seeming to favour White actors and actresses playing roles which would seem to naturally fit an Asian-American. Pan cast Rooney Mara in a role which was traditionally seen as Native American, while Emma Stone was cast as an Asian woman in Aloha and Scarlett Johansson has taken a role that would seem to be more suitable for a Japanese actress in the live-action adaptation of manga-hit Ghost in the Shell. The person who has come out most vocally is Constance Wu, a sitcom star in America who has expressed her disgust at the “whitewashing” before and very eloquently made her argument on twitter. In her argument she stresses that using “money” and “financing a movie” are really poor excuses and that we should no longer accept them as reasons for racism. Unfortunately, the studios are not the people Constance Wu should be addressing. It is quite naive to just expect studios to take a gamble with a Person of Colour (or POC as Wu puts it in her Twitter post) when they know that a large, well-known marquee name will help sell their movie. This is because stars equal money. Not all the time and of course there are box-office flops and examples when large stars can’t save a film but unfortunately, years of summer blockbusters and large tent-pole movies starring the biggest name in Hollywood at that time does ultimately, more times than not, equal success and then profits – the only thing a studio cares about. This is where we as audiences enter because we are the ones making that decision. We are the ones buying the tickets and delivering the profits. Studios follow what audiences do because they want cash and audiences are watching movies with larger, more notable stars involved. Unfortunately, those stars are White. Maybe Constance Wu should have appealed to the audiences instead? It is a vicious cycle which will struggle to be broken. While audiences flock to see movies with stars they recognise, studios will continue to cast White actors over People of Colour. One of the two has to give in and it won’t be the side which gamble their money on making the movie in the first place. Constance Wu asked studios to “take a risk,” “try to be better” and get some “balls” but that is easy to say from outside the system. It isn’t so easy to do when it is a large, effects laden blockbuster which people have signed off on and could very easily have their reputations depending on it’s success. What if a movie headlined by a Person of Colour flopped? Wu also comments on how great the pay-off would be if casting a Person of Colour worked and the movie was a huge success. What if it wasn’t though? What if that one studio taking a gamble meant that a Person of Colour starred in a box-office failure? Wouldn’t that hurt the cause rather than advance it? This is a situation which is terrible but unfortunately it is being fueled by the one thing it is difficult to fight against: Money. You will never change the attitudes of those that are gambling their profits and success so Wu should be appealing to audiences instead. Audiences need to change their attitude. However the issue then becomes that movies which star actors of Asian-American heritage don’t exist but they do, you just have to make people aware of them. Rather than Wu citing “Malala, Ghandi and Mandela” as the heroes, she should have cited great actors and actresses or their roles instead. Get people interested in the work of other actors of varying heritage so that studios can take notice. 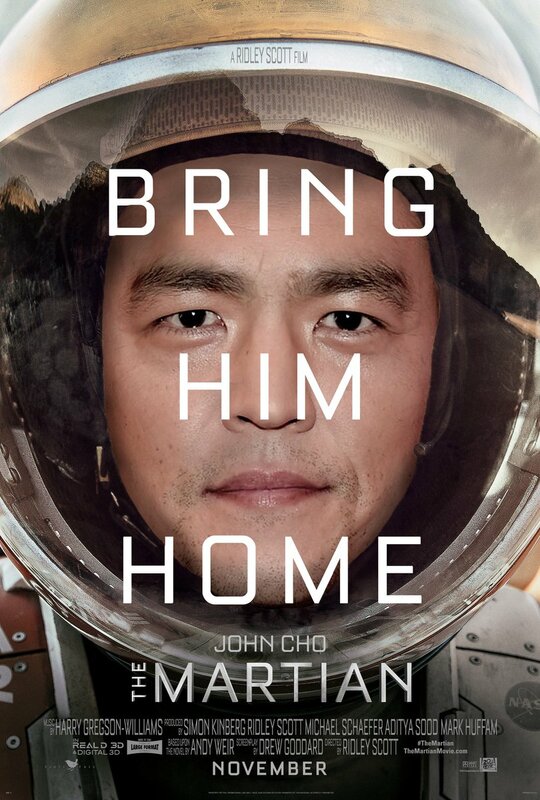 It shouldn’t be the viral campaigns which Photoshopped actors John Cho and Shah Rukh Khan into Matt Damon blockbusters. Instead of superimposing these actors into other people’s movies, draw people to their already notable works so some success comes from the work of the actor themselves. Overall, appealing to a large company’s “good nature” will not change anything, especially when money is involved. Audiences are what drive success. The same reason sequels, remakes and reboots crowd the summer blockbuster season is also the reason Hollywood are “whitewashing.” By highlighting the movies they could watch and could make successes of, maybe that would go some way to actually changing the attitudes of those that control the money and subsequently the casting. This is quite thought provoking, I hadn’t really considered this. Thanks! No worries. Thought it was a subject worth addressing. I guess we were lucky down here in Brazil to have the same rate of american TV shows and movies, as our own brazilian tv shows plus japanese hero shows and operas. We could´ve be watching “Bewitched” at 18:00 and then “Juspion'(an metal hero 1980s show) at 19:00, then some brazilian comedy and then some classic american movie at night, like “Superman”. Everything was amazingly dubbed in portuguese so the whole world was welcoming to Brazilians. So, as you say, complaning about “whitewashing” is odd, because it´s not only north americans who make movies. They can choose to watch argentinian movies, brazilian and colombian soap operas, chinese epic war movies and bollywood stravaganzas, and they are FUN. Although it isn’t just North Americans who make movies, it is Hollywood which produces the biggest and most popular movies. Unfortunately, they are trying to appeal to a largely white audience which ultimately leads to Whitewashing. It isn’t a good enough excuse but the audiences need to change their attitudes because the studios won’t. this is what i told once to a chinese young fellow, sometimes, it´s best to just watch the youtuber next door than spend money on some gigantic pile of garbage that doesn´t appeal to anyone, like “Gods of Egypt” and “Gods and Kings”.